Is A Bottleless Water System Right For Me? What Makes A Water Cooler Commercial Grade? Bottleless Counter Top Home and Office Water Cooler. At 17.35" tall will fit under all standard cabinets. Filtration System and Install Kit included, Commercial Grade Series, Dual Float w/ Emergency Shut Off System, Stainless Steel Tanks, Push Faucets with Hot Water Guard. The Clover D1-K Hot / Cold Bottleless Counter Top Water Cooler is a complete water station solution with filter; install hardware and water line included. No additional parts are needed to perform a basic install in a home or office. Using the D1-K also is good for the planet! The included filter will produce the equivalent 8,000 12 ounce plastic bottles of water. 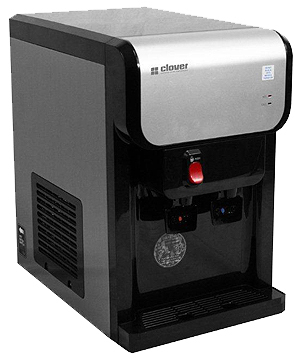 Clover is know for its exceptional craftsmanship in producing true commercial-grade water coolers with a classic, contemporary design and rugged durability that ensures years of hassle free use and enjoyment. The D1-K comes with rolled metal sides that are 7 times more durable than traditional stainless steel coolers and are treated with anti-fingerprint and smudge protection ensuring simple cleanup and hassle-free maintenance. Never buy another 5-gallon bottle again! The D1-K also comes with a dual float safety shut off system, Hot/ Cold output, Stainless steel tanks and paddle style faucets. Clover D1K is durable enough to withstand years of abuse and heavy traffic, offers a contemporary design that fits perfectly into any home or office décor, and a whisper-quiet running sound that will ensure it goes unnoticed except when it is in use. Enjoy crisp, clean, chilled drinking water anytime using the cold water push faucet. The Clover D1K dispenses hot water for instant coffee, cereal, noodles, and tea with a childproof safety faucet. The D1K comes with an impact-resistant, heavy gauge ABS plastic outer plastic shell that makes for easy cleanup and hassle-free maintenance in all home and office settings. The Clover D1-K Bottleless Water System is simple to install and can be done with basic tools by just about anyone, easily self-install the unit yourself or hire a handyman or plumber if you prefer. Installed this unit in office to replace bottled water dispenser service. Needed a compact size to fit in out small office kitchen. This was installed with in line water filter and water tastes great.